Published: Fri, March 16, 2012 @ 12:10 a.m.
A brine-injection well owned by D&L Energy Inc. in Youngstown halted operations after a series of small earthquakes. A year ago Saturday marks the anniversary of the quakes that gave us the shakes. The two low-magnitude earthquakes — felt by few but discussed by many — in the early morning of March 17, 2011, quickly became a conversation point at coffee shops, grocery stores and throughout the Mahoning Valley. For the better part of the past year, residents have received a geology education on how and why so many concentrated seismic events could happen in an otherwise calm area of Ohio. Ultimately, the story became less about the earthquakes and more about the industry. We learned the difference between fracking, the process in which water, chemicals and sand are blasted into shale rocks thousands of feet below the ground to release natural gas and oil, and injection wells, which dispose of the chemical-laced wastewater from fracking. We learned that most fracking wastewater originates from outside Ohio, and aside from a complete ban on injection wells, interstate commerce laws prohibit Ohio from turning away brine from states such as Pennsylvania. We also learned about different kinds of brine, all of which consist of different makeups and are of different weights, regardless of the state’s broad definition. We learned the Ohio Department of Natural Resources was slow to react to the cause of the earthquakes. ODNR did not start gathering the relevant information — depths, precise locations, etc. — until after James Zehringer took over as director Nov. 15. It was then ODNR sought out Lamont-Doherty Earth Observatory at Columbia University in New York to help it pinpoint exactly where the earthquakes happened beneath our feet. Eventually, the science and data caught up, solidifying the correlation. We learned that a burgeoning industry spawned the super well of all super wells: the deepest, highest-pressure brine-injection well in the Buckeye State (based on local geologic makeup). We learned that all injection wells are not created equal, and that in most instances, they are the preferred method of wastewater disposal. We learned about D&L Energy Inc., a longtime Youngstown-based company of about 100 employees, which insisted its well did not trigger the now 13 temblors. We learned about D&L’s past including its violations, which consisted of minor administrative breakdowns and a variety of water and soil contamination incidents, including one at a nearly completed site on U.S. Route 422 in Coitsville. We also learned D&L planned wells not just in Coitsville but also Girard, Hubbard, Campbell and North Lima. We added “Precambrian formation” to our vernacular and treated it like a phrase we learned back in middle school. The Precambrian — a nearly impermeable rock formation — was the crux of the injection well-earthquake correlation. D&L had drilled a well too deep into an unforgiving underground formation, which led us to a lesson in fault lines. We learned we were not alone. Arkansas experienced more than 1,000 earthquakes because of injection wells, and Ohio had a similar issue in Ashtabula. We learned injection wells could go anywhere, at any time, without any knowledge from local officials. That is, unless they read The Vindicator’s legal ads on a daily basis. But even if they do, they have no choice. 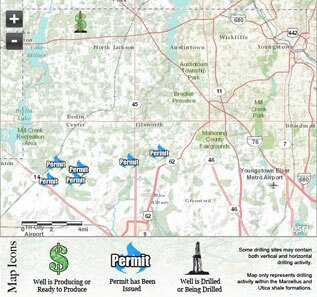 Injection wells, like oil- and gas-extraction wells, are regulated by the state and the state only. Local governments — such as Youngstown, which voted to ban injection wells within city limits — are powerless. We learned a lot, but that doesn’t mean we’re not still shaking.